Last month, PBO announced the renewal of Music Director Nicholas McGegan’s contract. 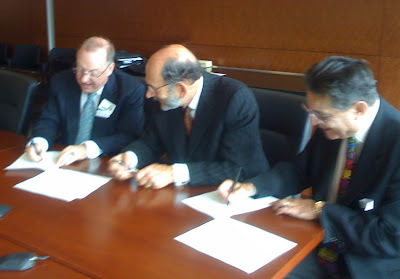 He signed the document, which extends his tenure through the orchestra’s 2015-16 season, with Board President Paul Sugarman and Executive Director Peter Pastreich on June 16 before the Annual Meeting (pictured below). Nic has artistically led PBO for its last 23 seasons. When PBO founder Laurette Goldberg discovered Nic in 1984 and approached him to replace her as music director, she noted that she was taking a risk on someone "whom nobody had hardly ever heard." Now, he is an internationally esteemed conductor, artistic director, scholar and musician. Besides his work with PBO, Nic is also the artistic director of the International Handel Festival, Göttingen, has teaching residencies at Juilliard and Yale, and guest conducts all over the world, including recent engagements with the Cleveland Orchestra, Chicago Symphony, New York Philharmonic, Los Angeles Philharmonic Orchestra and the Philadelphia Orchestra. Highlights this summer include performances of Handel’s Admeto and Acis and Galatea at the Edinburgh International Festival and conducting the Northern Sinfonia in a performance of Handel’s Messiah at the BBC Proms with massed choirs from throughout Great Britain. Read San Francisco Classical Voice's March 2009 interview. As Goldberg noted when she first met Nic almost 25 years ago, "The minute he opened his mouth, it took me thirty seconds to realize that this was the right person [to lead PBO]." What is your favorite memory of Nic?